Welcome to Universal Networks! We are a network sites offering useful services including free Webmaster tools, web design consulting and a Christian portal and customizable start page service. 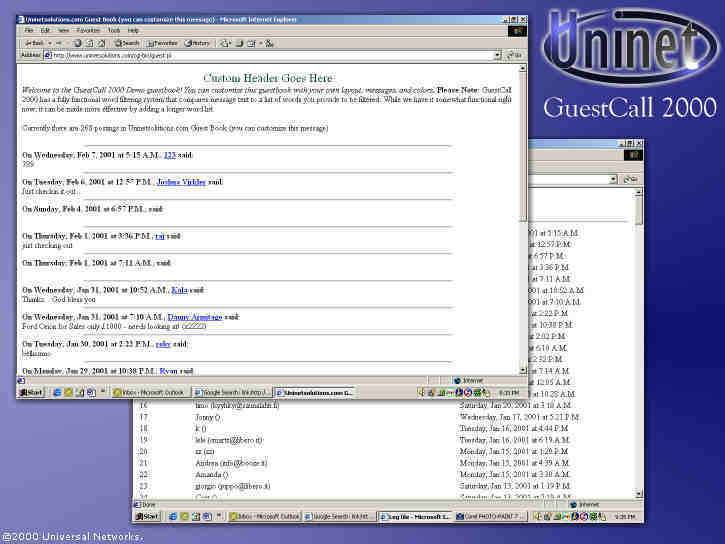 GuestCall 2000 is much more suited for large web sites than before. With new "multi-page" support, a site with virtually unlimited number of posts can configure GuestCall to divide postings on to multiple smaller pages - similar to how search engines divide results. Prevent visitors from messing up you guest book with long lines of characters or words without spaces by using GuestCall's word "splitting" feature. Keep tabs on the type of browsers your visitors use, and the times they post with the handy posting logs. Keep your guest book free of inappropriate language with easy to setup keyword filtering. Simply tell GuestCall what to remove from messages, and you can quit worrying. GuestCall 2000 is even more compact by combining log and message files into one more efficient data file. Easily delete files though a password protected web-based message purging interface - now built into GuestCall. Integrate your guest book with the rest of your site with the new ability to use your site's interface in GuestCall. Please click the image below to rate GuestCall!